Charades is probably my favorite game. On the surface it's about communication, sharing an idea through a limited medium (gestures). What looks like a communication obstacle to an alien observer is an enjoyable experience for the human participants. Sure, there's an idea to convey, but maybe there's a clever, funny, or astoundingly simple way to convey it. Aha! Math teaching should be the same: convey ideas with empathy for your audience. 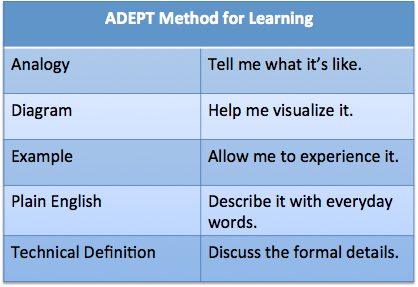 I use the ADEPT method to remind me of what helps me learn: an Analogy, Diagram, Example, Plain English, Technical Definition. How long did the idea take to be discovered? Accepted? If an idea was debated for centuries before being accepted, shouldn't that be taught? Sure. Ok. How many of you know that negative numbers were called numeri absurdi? Only accepted (in the West) in the 1800s? When we have struggles with new concepts (like imaginary numbers, also considered absurd), reference similar struggles in the past. Hey, you're confused? Good. So was everyone else, and here's how we resolved it. How long did you take to internalize the idea? Hey you (yes you, the teacher) -- what struggles did you have when learning? Did imaginary numbers click instantly, without doubt? Did the Fourier Transform just snap into place on your first reading? If you, the teacher, struggled with an idea, don't hide it: what tripped you up, how did you resolve it, and what issues do you still have? I needed simulations before I understood the Fourier Transform: playing around with them made it click. Instead of writing down the definition, share the "behind-the-scenes" of what helped. How comfortable are students asking questions? Learning is a back-and-forth process. If students don't have questions, they either understood it perfectly, or they are scared/uninterested. In charades, we can easily see if the other player is confused or having a good time. Are we trying to be defensive, or helpful? Academic writing is a bomb shelter, built to be defended from critics. Stable, rock-solid, but not welcoming. I'd prefer to make a beach bungalow you look forward to visiting. Yeah, the banana-leaf roof is leaky, and no, Dwight, it cannot withstand an aerial assault from AGM-114 Hellfire missiles. But we'll have a great time all the same. At some point you reinforce the bungalow, don't start there. Goal: Are we making students awesome? Giving impressively rigorous definitions on day 1 doesn't make students awesome. Ignoring historical and personal confusion doesn't make students awesome. Organized chapters of theorem/proof/exercise doesn't make students awesome. Share what actually worked, in a way you would have liked to see it.